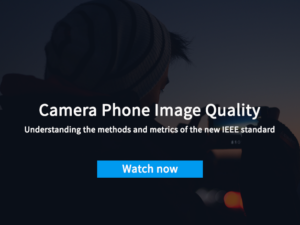 The Camera Phone Image Quality (CPIQ) standard seeks to standardize image quality test metrics and methodologies across the industry, correlate objective test results with human perception, and combine this data into a meaningful consumer rating system. The majority of consumers are unsure how to judge and compare device image quality. CPIQ serves as a way to assess and communicate image quality and dispel the myth that more megapixels correlate with better image quality. Experts from over 20 companies and a range of industries, including mobile, OS, chipset and handset manufacturing, and test software, are committed to creating these metrics. In order to maintain consistency across different organizations, CPIQ maintains a liaison relationship with the International Organization for Standardization (ISO). Future revisions of the standard that are under development will cover white balance, autofocus, video quality, dynamic range and many more relevant image quality factors.